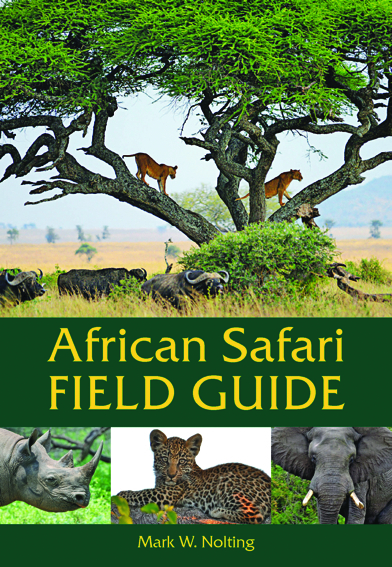 The African Safari Field Guide is an absolute must to take on safari as it is a wildlife guide, trip organizer, resource directory, language guide, map directory, wildlife checklist and journal—all in one! The African Safari Journal & Field Guide is the perfect book to take on safari because it is a wildlife guide, trip organizer, phrase book, safari diary, map directory and wildlife checklist, all in one! And because many safariers have strict baggage limits, this 7-BOOKS-IN-ONE journal becomes even more valuable because it features all the information a traveler to Africa is going to need. It puts key safari information at the reader's fingertips and allows them to record unforgettable memories of their African adventure. Over 500 COLOR illustrations and detailed descriptions of mammals, reptiles, birds, insects and trees for easy identification.